Chronic obstructive pulmonary disease (COPD), also known as chronic obstructive lung disease (COLD), or chronic obstructive respiratory (CORD), is a major economic health burden throughout the world in terms of both direct health costs and lost productivity. It is rated as the sixth commonest cause of death worldwide, and in New Zealand it is the fourth commonest cause of death. It ranks high amongst the major causes of disability and profoundly affects the quality of life of its sufferers. Estimates are that it affects 200,000 New Zealanders and up 15% of adults over the age of 45 years may have COPD: many of these people will not be aware that this is the case. Whilst there is a plethora of information available on COPD, much of it is dispersed in small non-cohesive fragments and scattered through various resources. Much of the information available (e.g. on the Internet) is not relevant to New Zealand. This book brings together a wealth of well researched information from various sources and presents it in a cohesive and ordered manner which is applicable to New Zealand. 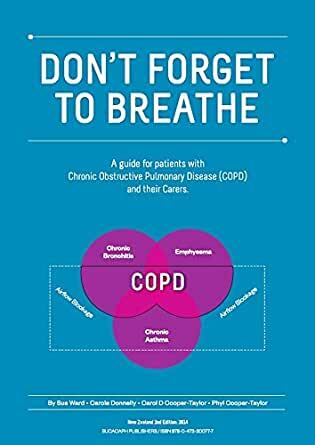 Readers of this book, sufferers of COPD, and other health professionals will find much helpful and practical information to help them deal with the various issues that afflict sufferers with COPD.